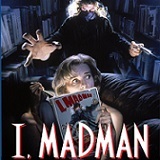 After a spine-tingling paperback catches the imagination of bookstore clerk Virginia, she seeks out the author's second book, I, Madman. But once she opens the cover, its eerie tale of obsessive love comes to life, catapulting a disfigured, scalpel-wielding killer from the world of fiction onto the streets of Hollywood with one demented goal: to win Virginia's love, one murder at a time! 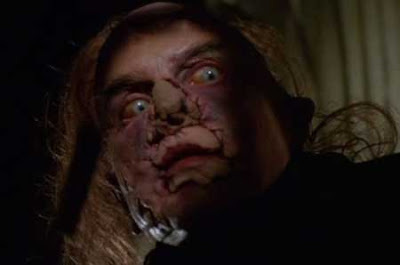 Directed cult filmmaker Tibor Takacs (The Gate), I, MADMAN stars Jenny Wright (Near Dark, The Lawnmower Man), Clayton Rohner (April Fool’s Day, The Human Centipede III) and three-time Academy Award winner Randall William Cook (Dr. Caligari) as the mysterious and frightening Malcolm Brand. Virginia works in a used bookstore and reads a lot of different books. She’s reading a book by author Malcolm Brand about a doctor in the 1950s that created a half jackal/half human boy. He locks him in a trunk and hides in a hotel where he turns his room into a lab. As Virginia reads the story, she transports herself into the book and portrays the heroine in the book. Back in reality, thunder and lightning crash and Virginia is snapped out of her book. She is a bit frightened, and calls her boyfriend who is a police detective. When she finishes the book, so goes in search of the author’s second book, I Madman. She searches all over her book store and can’t find it. When she arrives home that evening, the book is waiting for her. As she reads, strange things begin happening and the murders in the book start coming to life. 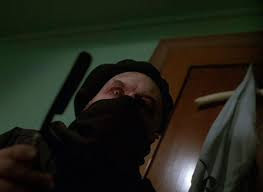 Virginia tries figuring out the pattern and once she realizes the killer is the doctor in the book and he has come out of the pages to wreak havoc in the city. Virginia’s friends are dropping like flies, but for some reason, the Madman doesn’t kill her. When she figures out the next victim is her friend and co-worker, Virginia rushes to the bookstore, where she finds the madman waiting for her so he can complete his plan. Just before the madman can take Virginia, the jackal boy, who has come alive from the pages of the book, exacts his revenge at takes the madman down. At first, I was expecting a really cheesy movie with bad special effects. Don’t get me wrong, the special effects were bad, especially the jackal boy… oh my gosh, was that ever bad. But the story was interesting and fun and seemed very film noir, especially jumping back into the pages of the books and the changing of the time periods. For a 1980s movie, it wasn’t “too” 80s. The acting was pretty good and Jenny Wright was really good playing Virginia in both the present and the past. The transitions from book to reality were seamless and I really liked seeing how it was done… walking out of the frame in one time period/outfit and re-entering in the other. Randall William Cook was good at Malcolm Brand/Madman. He was terrifying and I can only imagine how difficult it was to get his make up on and off and direct the visual effects at the same time. I, Madman surprised me and I enjoyed it more than I thought I was going to. The 1080p high-definition widescreen presentation was good. The picture was clear and I didn’t encounter many pops or crackles in the picture. Colors were sharp, and the transition between scenes was good. Much of the picture was dark, but the scenes were bright enough that I didn’t have any problem making out what was on the screen. 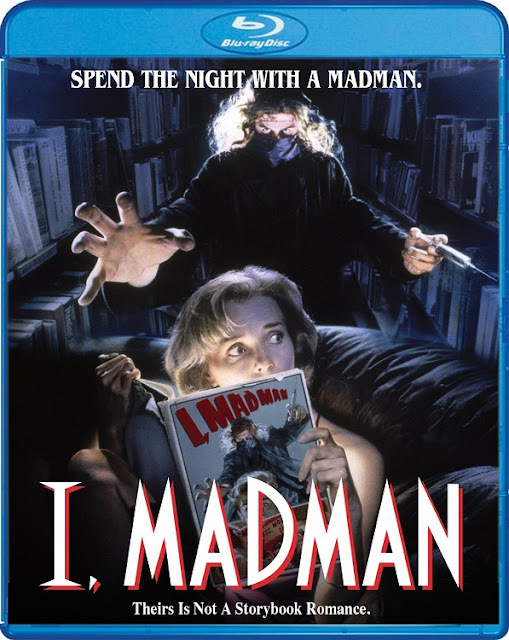 For a 80s movie, I, Madman was a good transfer to Blu-ray. I, Madman’s DTS-HD master audio was good; I didn’t have to adjust the volume much at all. Background music and sounds blended well and did not overpower the dialogue, which was clear and easily heard. The even soundtrack made for a creepier viewing of the movie. I enjoyed the special features more than I thought I would. The behind-the-scenes footage was interesting and the still gallery with narration was fun to look at. I don’t normally like still galleries, but this one really kept me interested. I’m not a big fan of special features in general, but these were pretty good. Ripped from the Pages: The Making of I, Madman: Thirty three minutes of behind the scenes of the movie with comments by cast and crew. The feature was really informative and I enjoyed hearing from the cast and seeing what they look like now. I was especially surprised at how normal looking Randall William Cook is after seeing him in all the make up for his character. Behind the Scenes Footage with Commentary by Randall William Cook – Eleven minutes of behind the scenes footage of the film. This is narrated by Randall William Cook, who played Malcolm, the Madman. In it, he e the visual effects and his make up process. He also discusses the Jackal Boy creature and how he used stop motion animation to create the creature. This feature was interesting, but the narration sounded like he was reading from a script, rather than just talking about the processes. Theatrical Trailer – The official trailer for the film, under its original title Hardcover. It’s very creepy and makes me want to see it. Still Gallery with Commentary by Randall William Cook – Once again, actor/special effects guy Randall William Cook narrating over the different still photos from the movie. This is one of the few still galleries that has narration and I appreciated that. Photos include cast and crew, locations and artistic interpretations of the movie. The narration was interesting because he told anecdotes from his time on the set rather than just explaining each of the photos. It was nice to hear personal stories from the cast about his experience making the film. I, Madman was surprisingly a good movie. It melded fantasy and reality together well, and I liked the concept of a scary book coming to life. While it is a 80s horror movie, it’s not your typical 80s horror movie. I’ll definitely watch it again and will probably like it more after the next viewing.